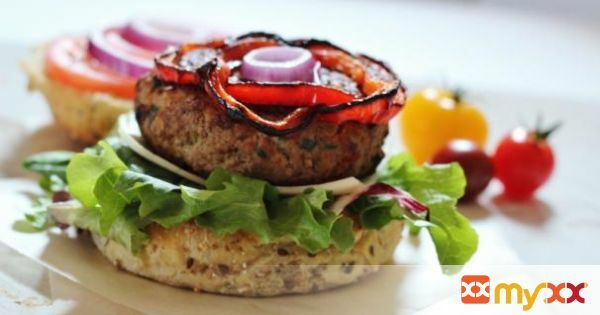 Extra lean ground turkey combined with loads of veggies - carrots, spinach, bell peppers, zucchini to make a healthy, juicy burger that stretches your grocery dollar too! 1 red bell pepper cut into rings if desired for garnish. 1. Mix all ingredients in a large bowl. Don't overwork it - just combine enough to have it well mixed. 2. Form 4-6 round patties. Cook on med-high heat until done. If unsure, insert a thermometer - 165 F is the temp. you are aiming for. 3. For roasted red pepper rings, seed and slice red pepper, spritz with olive oil and bake at 425 for 20 minutes.